It’s not all pink, floral prints and sparkles. The feminine touch in home décor takes on many styles. For some it is natural comfort and a neutral colour palette with hints of pastels, for others it is soft lines and elegant sophistication with a sprinkle of sparkle and for some it is symbolic of the female energy itself, the freedom to express a style as unique as the woman herself. In this beautiful Somerset West home, interior designer, Michele Fortune had to marry the classical and modern tastes of husband and wife homeowners Jordão. The result is a neo-classical interior design that answers their brief for a luxurious, chic, children-friendly home with light natural colours and fibres. When appropriate i.e. in the daughter’s bedrooms and guest bedroom, the home has a delightful feminine touch and in shared spaces such as the living and entertainment areas, this is just a subtle, gentle touch. The family, seemingly, share a love for design that is homely, comfortable and calming. The interior design of the daughters’ bedrooms demonstrates this love and follows the brief for a natural colour palette but with highlights of pinks and greens. 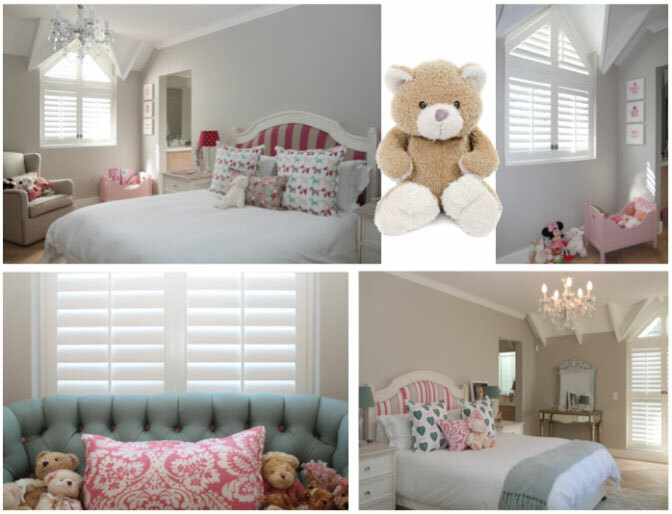 Designed to accommodate their changing lifestyles and maturity as they grow up, the bedrooms each have a unique style; the youngest daughter’s room makes space for toys, dolls and play and the older daughter’s room is centred on ‘chillaxed’ comfort, an ideal space for me-time or hanging out with friends. Decowood shutters were used throughout the home. Chosen because of their practicality, durability and style, the shutters offer utmost light, ventilation and privacy control. The triangular window shape posed no problem for these shutters as they are easily customised to fit unusual shaped windows and doors. 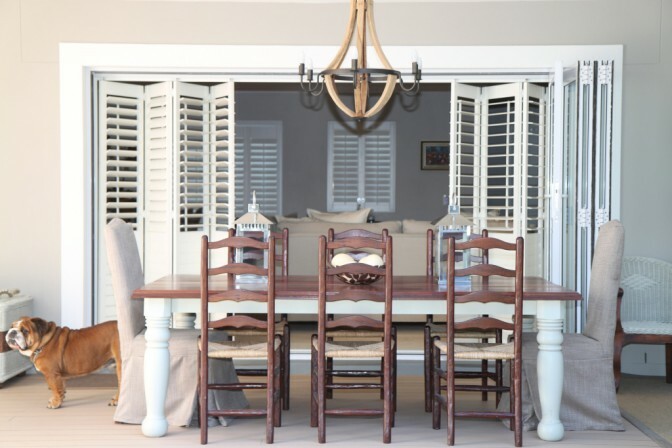 The Decowood range is AMERICAN shutters’ most eco-friendly range, another priority for homeowners and designer. 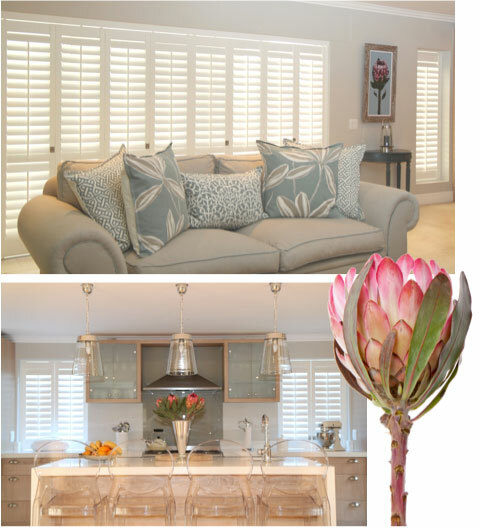 Asked why she chose AMERICAN shutters Decowood range, Michele’s answer was quick and simple, “quality”. The guest bedroom has its own unique feminine touch. The carved wood four-poster bed, soft neutral colours and textures, the light refection of the arched mirrors above the bedside tables and the filtered light through the shutter louvres give the room a whimsical almost magical quality. All the bathrooms in the home also have Decowood shutters installed. Suitable for use in bathrooms and kitchens, Decowood shutters are hardwearing and easy to clean and maintain. As friendly and welcoming as Basil the bulldog, this home has a warmth and energy undeniably feminine, albeit it subtle and understated. My style is very flexible from ultra modern lines to a classical look (just not frills). My favourite style is a neo-classical. Lots of Googling, Pinterest and my favourite decorator, Kelly Hoppen. Natural fibres and natural woods are my favourites; I just love the movement and touch of linen fabrics and woods. My industry is about touch and luxury, so love it! What do you believe the next big trend in interior design will be? Gold, which is already all the craze overseas. Why did you choose AMERICAN shutters’ Decowood shutters for this project? I chose it because I know what I’ll get – Quality. Also it is the correct product in the Cape because of the moisture.